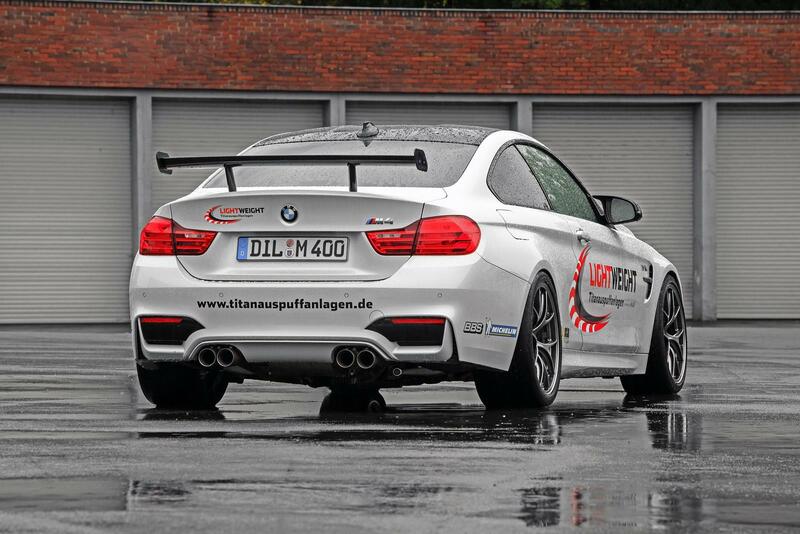 German tuner Lightweight has developed an upgrade kit for the BMW M4 Coupe with 520 horsepower. The Alpine White M4 gets a series of aero upgrades, starting with the front lip made of carbon fiber, the rear racing wing made from the same material, and carbon fiber mirror caps. Furthermore, Lightweight also installed a titanium exhaust system with valve control. An optional stainless exhaust system is offered as well. Stock wheels were replaced with a BBS 19-inch set wrapped around in Michelin Pilot Sport Cup 2 tires measuring 265/35/19 front & 285/35/19 rear. To lower and improve the ride, a Bilstein Clubsport suspension package was added as well. But the real upgrade comes from under the hood where Lightweight worked on the 3.0-liter 6-cylinder TwinPower Turbo and bumped its output from 431 HP (317 kW) and 550 Nm (406 lb-ft) to 520 HP (382 kW) and 650 Nm (479 lb-ft) of torque. The added parts take the BMW M4 price from 72,000 euros to 89,000 euros. Lightweight says a new upgrade program is in the works and will include things like an adjustable front spoiler blade, carbon fiber diffuser, trunk spoiler lip, enclosed underbody, roll cage and bucket seats equipped with six-point harnesses.